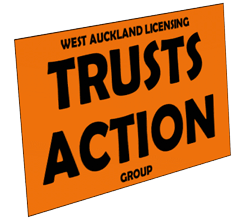 The monopoly rights held by the West Auckland trusts are not exhaustive. There are a couple of exemptions for off-licenses and for on-licenses it only applies to taverns and hotels. One off-license exemption is for production sites such as wineries and breweries. The exemption means that manufacturing premises can get an off-license and therefore sell their own product, but also any other products they choose to range. They are not limited to their own products or category in any way. There are a few wineries in the district that have off-licenses and also Hopscotch has recently been in the NZ Herald with their nano-brewery. There’s also an exemption for retailers that previously held a Wine Resellers license (back in the 1960’s) and they can continue to get an off-license, though they are limited to selling wine e.g. Wine Villa in Kelston and Te Atatu and also Lynnmall Cellars. So unless the premises is used for manufacturing, or the premises held a wine resellers license a long time ago (and has continuously held an off-license since then), only the licensing trust can hold an off-license in the district. Regarding on-licenses, The Trusts are always keen to reiterate the point that anyone is free to open a licensed restaurant in West Auckland, just the same as anywhere else in NZ. They are absolutely correct. There is also a widely held misconception that The Trusts have a role to play in the issuing of alcohol licenses to other operators such as cafes and restaurants. This is not the case. Auckland Council issues the alcohol licenses and The Trusts hold no additional rights to appeal license applications. Although The Trusts reiterate this point regularly, the misconception remains. It must be very frustrating for them. The Trusts don’t have any special rights or role in enforcing licensing rules/conditions either. Responsibility for enforcement lies with Auckland Council and the Police. The Trusts applies for alcohol licenses in exactly the same way as any other operator. Auckland Council receives the application and the District Licensing Committee decides if the license will be granted. The monopoly simply means that anyone applying for an alcohol license where the monopoly applies (such as a tavern on-license) will be automatically declined unless the applicant is the relevant Licensing Trust. So only The Trusts can operate a tavern out West. But anyone can operate a licensed restaurant. Is there any difference? Let’s explore. The Act provides definitions of both taverns and restaurants. So what’s the point of the different classes of restaurants? That is simply how they set the fees. Class 1 Restaurants are perceived to pose greater risk in the way they manage their casual drinkers, therefore they pay higher fees. There is clearly a difference between taverns and restaurants. In practice, how does the DLC (and ARLA on appeal) determine if a premise is primarily serving meals (i.e. a restaurant) or alcohol and other refreshments (i.e. a tavern). There is no formula to apply for determining the principal business of a premise. On each occasion, the DLC will make a judgement after evaluating and weighing the relevant matters. Restaurant licenses always have a condition that states something like “b) liquor may be sold only on the following days and during the following hours when the premises are being operated as a RESTAURANT…”. It follows that a premise cannot operate as a tavern at certain times and as a restaurant at other times. A restaurant cannot close the kitchen and continue to serve alcoholic drinks. When the kitchen closes – so must the bar. (NB – Patrons consuming drinks at the end of a meal will be considered diners for about an hour after they finish eating, after that they will be considered casual drinkers). Patrons eating food is not the same thing as serving “meals”. A meal must involve and centre around consumption of food. Wedges, nachos, french fries, and similar, while clearly qualifying as ‘food’, may not be ‘meals’. However, context is important. For example, eating Nachos at a Mexican restaurant is more likely to be considered a meal than eating Nachos in the bar area of a bar/grill. Making meals available does not satisfy the requirement that a restaurant serves meals. That is, just because the kitchen is open and meals are available isn’t enough. The requirement is for meals to be served at all time when the business is authorised to be open for the sale of liquor. In plain English, if no-one is ordering / consuming meals for any length of time, the bar should be closed. However, ARLA are pragmatic in their judgments and have stated “Where over time a large number of patrons are observed not to be consuming any food the premises cannot be said to be ‘principally’ used for the supply of meals”. So it’s not interpreted too strictly. It is always a judgment made by the DLC / ARLA and there is a good dose of reasonableness in their interpretations. Should there be a period of time where meals are not served and causal drinkers dominate, ARLA’s judgment will be influenced by the frequency and duration of these periods (i.e. how often, how long). The Class 1 restaurant definition states that it operates as a tavern at least one night a week (thereby implying that such operations are acceptable), but it is not the overall premises that can operate as a tavern. Only the bar area can operate as a tavern, in the context of the overall premises principally serving meals. There has been some misconceptions amongst all involved in alcohol licensing around classes of restaurants, especially class 1. Being a class 1 restaurant does not entitle the restaurant to act as some form of mini tavern. A class 1 restaurant has the same obligations as to service of meals as any other class of restaurant. The classes of restaurant are simply for fee setting purposes. The classes of restaurant are based on how a restaurant deals with the consumption of alcohol especially its casual drinkers and that the restaurant should be charged a fee reflecting their perceived risk. Therefore the fees regime envisages that in the significant separate bar area alcohol will be served without meals to patrons in that bar area, i.e. casual drinkers. Because this poses a perceived high risk class 1 restaurants accrue more points in the risk rating. Class 2 and class 3 restaurants are set up to deal with the consumption of alcohol including casual drinkers in a different way and are perceived to be a lower risk and therefore accrue less points. A meal must involve and centre around consumption of food. Where patrons are able to drink alcohol without consuming any food, they cannot be said to be having a meal. So to be clear the introduction of classes of restaurants has not changed the law in relation to the need for meals to be eaten at a restaurant; the classes simply dictate the fee to be paid based on how the restaurant is set up for the consumption of alcohol.